JULY 16, 2010 — Someone once asked St. Bernard of Clairvaux what the three most important virtues are. He famously replied, “Humility, humility and humility.” Anyone who has studied the lives of the saints will tell you that this 12th century saint had it right. Humility is a prerequisite for sanctity. 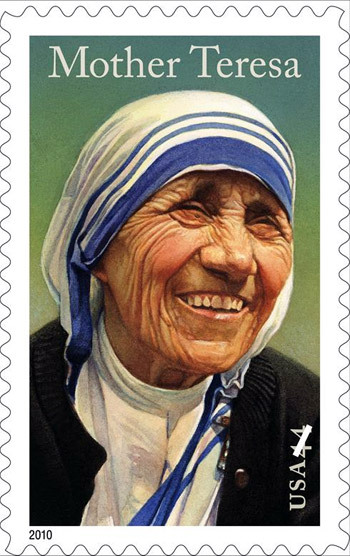 USPS will issue this stamp on the centenary of Mother Teresa's birth, Aug. 26, 2010. Prior to Mother Teresa’s death in 1997, people called her a living saint precisely because she lived humility. She wore the same old, patched sandals until they fell apart. Everything she owned fit into a small bag, yet she built one of the largest, most vibrant religious orders of the 20th century. Those who have read about the famous nun’s life often ponder how a diminutive little woman from Albania came to build an order of 4,500 nuns in 133 countries in less than half a century. There is no question that Mother Teresa’s secret is found in her total surrender to the will of God. Secondly, humility. Legatus Magazine‘s July/August cover story relates how seminarian Christopher Nalty once rolled his eyes after hearing Mother give her “stump speech” to visitors on how many houses the order had. She wasted no time in setting the future priest straight. I didn’t have the opportunity to meet Mother Teresa myself, but a few months after her death, I had a sit-down interview with Sr. Nirmala Joshi, her successor as superior of the Missionaries of Charity. I asked her about Mother’s legacy, her work and Divine Mercy. The one thing that I’ll never forget about that encounter with Sr. Nirmala was that the answers she gave were exactly what I’d expect to hear from Mother Teresa. In all things, she gave thanks to God, taking no credit for her work. In fact, Mother Teresa said she hand-picked her successor because she was among the least qualified. In that way, any success could only be attributed to God. Lesson learned. Patrick Novecosky is the founder and editor of Legatus Magazine. This article appeared in the July/August 2010 issue of Legatus Magazine. Reposted with permission.